After a long wait (or is it just the craving for baseball? ), the results of the widely anticipated 2017 BBWAA election for the Baseball Hall of Fame have been revealed. Three players received the necessary 75 percent of the vote this time around, the fourth consecutive year with multiple inductees. After a narrow miss last time around (71.6% in 2016), Bagwell easily surpassed the required number of votes this year. Bagwell had a career slash line of .297/.408/.540, while also hitting 449 home runs and stealing 202 bases over the course of his career. He’s one of nine players in MLB history to tally 4,000 total bases, draw 1,400 walks, and steal at least 200 bases. Of those nine players, only Barry Bonds had a higher career OPS. He’s responsible for two of the eleven 40/30 seasons ever, which is even more incredible given he’s the only first baseman to do it at all. 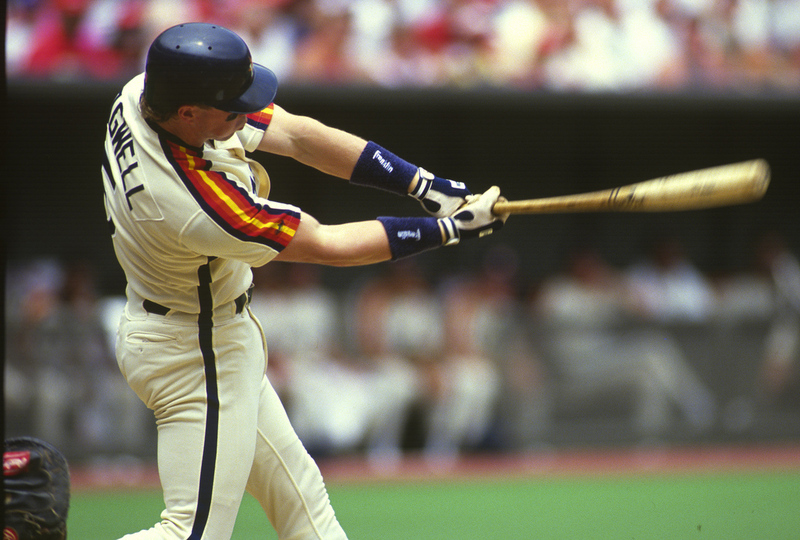 In 1994, his fourth season in the bigs, the Astros first baseman slashed .368/.451/.750. Only four other players have matched each leg of that line in a single season: Babe Ruth, Bonds, Lou Gehrig, and Rogers Hornsby. That’s remarkable, and it’s not difficult to see why he’ll have a plaque in Cooperstown. The wait is over — Raines will be inducted into the Baseball Hall of Fame! After nine ballots not meeting the Hall of Fame vote requirement, Raines had one last shot to get in this year. It seems that the various Twitter campaigns (Jonah Keri, Ryan Spaeder, etc.) played a huge role in getting him elected, opening the eyes of voters as to what they were missing out on. Let’s create a hypothetical player … this hypothetical player had the batting average of Frank Robinson, the on-base percentage of Willie Mays, and the slugging percentage of Joe Morgan. Not good enough? What if that player had nearly 1,000 stolen base attempts, and had a higher stolen base percentage than Rickey Henderson? Yeah, that guy had to wait 10 ballot cycles before finally getting some love from the writers. Raines stole 808 bases and hit 170 home runs, adding on to his career slash line of .294/.385/.425. Despite being on his first year on the ballot, Rodriguez will join the aforementioned players in the 2017 Hall of Fame class. Pudge was a threat at the plate and behind it, and the BBWAA voters were convinced that he played a Hall of Fame career. With a career slash line of .296/.334/.464, slamming 311 home runs and adding 2,844 hits, all while playing catcher in at least half of his games in each of his 21 seasons, it’s easy to see why. Additionally, I-Rod led his league in caught stealing percentage (as a catcher) in six consecutive seasons from 1996 to 2001 (and 1992, 2005-06). With fourteen All Star Games under his belt, thirteen Gold Gloves, and seven Silver Sluggers, it’s arguable that Pudge was one of the most all-around catchers to ever play the game.